As you know (because I go on and on about it ALL THE TIME), I used to work in book publishing. I spent nearly ten happy years there because I’ve always been fascinated by authors, books and the writing process in general. This interest hasn’t waned, even though I no longer work in the industry, so I’m chuffed to bring you an interview with author Melissa Delport today, who I’ve just discovered recently. Where did your love of books, reading and writing stem from? I always loved to read and write, and from a young age my nose was stuck in a book. I won all the bookworm awards at school! There is nothing better for me than the pure escapist fantasy that comes with discovering a new world to get lost in. I read very quickly, though, so sadly I am all too soon on the prowl for a new book discovery. As to my own writing, the same is true. I loved to write from a very early age – my cupboards are crammed full of poetry from my angry teens, a stack of unfinished handwritten manuscripts from my early twenties, and of course, the print-bound works that mark the final success of my thirties. I always wanted to write, but I also wanted to be financially secure and sadly the two don’t always go hand in hand! I put writing on hold for a long time after university but I am so glad that I came back to it and am now fortunate enough to make a career out of my passion. Oh, I have a beautiful, beautiful family. I married my childhood sweetheart, who is the love of my life, and we have been blessed with three gorgeous children, aged 7, 4 and my baby is about to turn 3. What’s your secret to owning a business, writing books and being a mom to three kids?! How do you do it all? It didn’t come without a price initially and I sacrificed a lot of “me” time. I spent most days looking frazzled, with hair scraped back and food on my clothes (situation normal for any mother of small children!). But I am the type of person who thrives under pressure. If you give me one thing to do, it will take me a week to get around to it, but bombard me with tasks and I’ll have everything done before lunch. I struggle to ‘shut down’ though and my mind is always operating on hyper-drive – planning, plotting, making lists. I’m a big list-maker, I can’t survive without my ‘to do’ list (sounds like me and Melissa are kindred souls in the list-making regard;). Tell us a bit a bit about your new book The Legacy. The Legacy is book 1 in The Legacy Trilogy, which is a dystopian action-adventure series set in the U.S after World War 3. The book follows the life of Rebecca Davis, who becomes the ultimate weapon for the Resistance, who are plotting to bring down the tyrannical rule of the New United States of America. The story centres around the struggle for freedom from oppression, as well as fighting for survival in the bleakest of circumstances. It is fast-paced and action-packed. Book 1 (The Legacy) and Book 2 (The Legion) were released in July 2014, with book 3 (The Legend) coming early 2015. Any tips to aspiring writers who want to get published? Thanks to Melissa for the interview and best of luck in your exciting career as an author (me, envious? Never!). 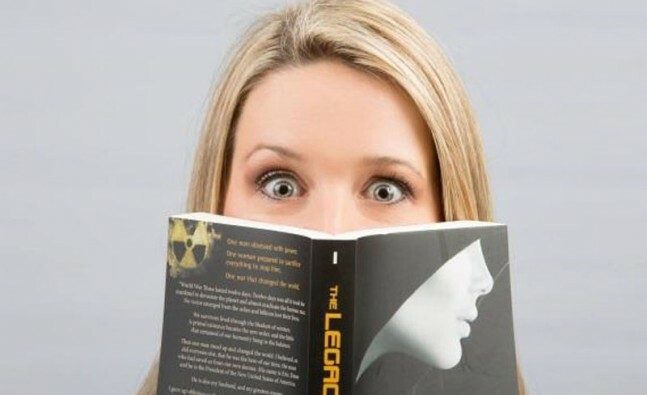 The Legacy it is available in print and as an e-book (for only R61 – bit of a bargain! ).